Deluxe edition releases: Troublegum and Infernal Love by Therapy? 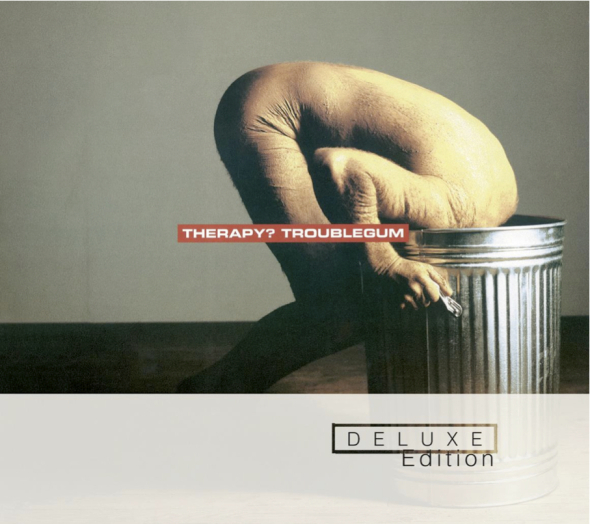 Next March UMC/Mercury will release Therapy?’s 1994 tour de force, Troublegum as a superb 3 CD Deluxe Edition to celebrate the 20th anniversary of the album’s original release. It will be released alongside a deluxe edition reissue of the following year’s Infernal Love. All of this will coincide with a short run of UK shows by Therapy?, also in celebration of Troublegum’s 20th anniversary. The set on each night will feature Troublegum in its entirety plus a host of other musical treats from around the same era of their recording career, and will include rarely heard B sides, the ShortSharpShock, Face the Strange and Opal Mantra EPs. The support on the tour will be hotly-tipped British rockers, Lonely The Brave. The tightly wound punk-metal of Troublegum propelled Therapy? into the UK Top 5, sold 750,000 copies worldwide and spawned no less than five Top 40 singles ('Turn', 'Nowhere', Die Laughing', Trigger Inside' and 'Screamager', the lead cut from the 1993's Shortsharpshock EP), landing the band a Mercury Music Prize nomination in the process. The black-hearted melancholia of 1995's Infernal Love was a radical departure for the trio. Bound together by Belfast-born DJ David Holmes' cinematic soundscapes, the album was a brooding, twisted, heroically unhinged affair. More recently, Therapy? have enjoyed success with their 2012 album A Brief Crack of Light, and they have spent the last eighteen months touring mainland Europe, UK, Ireland and beyond. Not content to sit on their laurels they are currently working on a new studio album due for release in late 2014.